This Von Duprin EL99L is a rim exit device with a lever trim and electric latch retraction. The EL feature which is an alternative to manual dogging, allows for the remote unlatching of exit devices. A control station operator can easily an exit door to push pull operation by simply flipping a switch that will retract the latchbolt. Rim cylinder includes 2 keys. 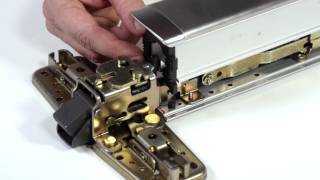 EL option (Electric Latch Retraction). The EL feature allows for the remote unlatching of exit devices. A control station operator can flip a switch to retract the latch bolt and immediately change an exit door to push-pull operation. The EL option does not include the power transfer from door to frame, the power supply, or the control operator . The EL feature is an alternative to manual dogging. 8" X 2-3/4" X 2-3/8"
This exit device includes a special feature known as Electric Latch retraction (EL). This feature will enable you to unlatch the exit device from a remote, convenient location. You can simply flip a switch from the comfort of your desk to retract the latch bolt thereby making it possible to operate the door just by pushing or pulling it.